I recently adopted this cat from a private owner off of Craigslist. I was told he was a purebred Snowshoe Siamese but he just doesn't look like any Snowshoe I have seen online. I do not know much about cat breeds, but I don't think a Snowshoe Siamese is even a purebreed? He has white toes but looks darker in color than most Siamese cats. I don't care if he is purebred Siamese or not, but I am interested to know what breed or mix he is, as I have not seen another cat exactly like him. I don't think your cat looks like a purebred Snowshoe either! 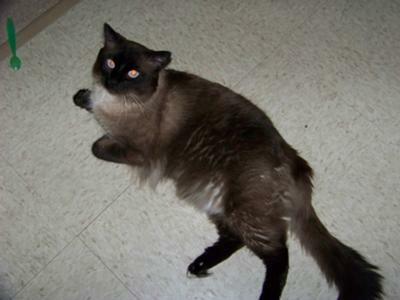 Snowshoes are an accepted breed in some cat registries, but they are short-haired cats, as you can see in the picture on my Snowshoe Siamese page. Leonard Berlioz looks like he has quite long hair (and a fluffy tail), and seems to me more like a Ragdoll or perhaps a Birman, or a mix of one of these. Ragdolls, in particular, have a very placid nature so perhaps the fact that your cat is scared of heights and mice might suggest that he may be one of these? Ragdolls and Birmans are both white-footed cat breeds, although the Colorpoint Ragdoll that you can see at the bottom of the Ragdoll page (which Leonard Berlioz looks most like, to me) is not actually supposed to have white toes. Cat genetics are so complicated that it's always difficult to say exactly what kind of cat you have, when you don't know who the parents were. One thing we can say for certain is that in color, he's a seal point. Seal points often get very dark when they get older, and to me, your cat is a classic older seal point. I hope this helps get you a little further! He's a beautiful cat, whatever his breeding might be.